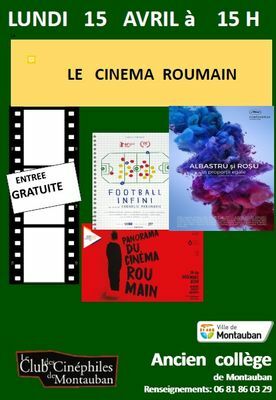 The Montauban film lovers' club organizes a cinema session MONDAY APRIL 15 at 3 PM at the former Montauban college - 2 aisle of the Emperor with the screening of the documentary CINEMA MON AMOUR by Alexandre Belc (2015) in Romanian subtitled in French. Duration: 1 h 20. The film will be presented by Henri Guieysse with a presentation on Romanian cinema. FREE ADMISSION . Before the fall of communism, the state-owned company Romania-Film owned nearly 400 cinemas. It remains today just 30. The Dacia Panoramic, in the city of Piatra Neamt, is one of these rooms. It still exists, despite its dilapidation and lack of spectators, just because of the passion of his manager, Victor Purice. Through her portrait, Alexandru Belc also paints the nostalgic and desperate picture of the state of cinema in Romania. Victor does everything for the Dacia to survive: go underground to repair the heat, go on TV to tell the story of his room, install a projector to show movies on DVD. He fondly remembers the 907 tickets sold for Titanic, a golden age when the cinema was not yet decrepit. Today, her two employees bring hot teas and blankets to the rare spectators of the icy hall, while Victor struggles to get appointments and helpers. He visits a hall in Germany whose director graciously offers him seats, but can not transport or meet in Bucharest a representative of Romania-Film, who has no solution to bring him. Far from his family emigrated to Italy, Victor still fights only for his employees and for the sake of cinema: when he discovers with emotion a 35mm copy of a western that he identifies from the first vignette, he can not prevent him from being projected for himself alone, the last spectator of his ghost room.